Taking youth on rafting trips down the Colorado River in Grand Canyon and San Juan river in Utah, Megan Dwyer has learned a lot about going with the flow and living a life of service. Megan served in AmeriCorps through the Youth in Action AmeriCorps program in Flagstaff, Arizona, serving at a nonprofit called Grand Canyon Youth (GCY). After service Megan was hired on full time at GCY. Her stories include her first trip on the river as a teenager, guiding teenagers in setting up their own service project to better understand homelessness, and taking unique trips down the river with youth who have lost a parent in the military as well as youth with physical disabilities. ANNOUNCER: This is Do Good, Be Good, the show about helpful people and the challenges they face in trying to do good. You host is Sharon Tewksbury-Bloom, a career do-gooder who also loves craft beer and a good hard tackle in rugby. Sharon speaks to everyday people about why they do good and what it means to be good. SHARON: Hi everyone, I am your host, Sharon Tewksbury-Bloom. Today’s podcast is brought to you by the Do Good, Be Good AmeriCorps training series. More on that later. My guest today is Megan Dwyer. I met Megan when she came into my office to interview for the AmeriCorps position at Grand Canyon Youth. You will hear all about that position in this episode. Grand Canyon Youth leads educational river trips for middle school and high school students. Megan grew up in Flagstaff, Arizona where Grand Canyon Youth is headquartered. She went on a river trip with them when she was young and that is how she first discovered her love of rafting. One more thing you should know before we get started. Flagstaff is home to the largest contiguous Ponderosa Pine forest in the whole world. Ponderosa Pines are notoriously hard to grow. They require fire and monsoon rains and it takes many years for a new crop of baby trees to sprout. Ok, let’s get into the episode. MEGAN: Having a water highway instead of the normal highway to get from place to place; it just blew my mind, it was so much fun. I remember wearing some river clothes the next day to school and it was very clear how far I had gotten myself stuck in the mud. You know there was a clear line on the shirt and my friends were like, “why are your clothes so dirty?” I was just, I was so proud of these clothes that you couldn’t take them off of me if you tried. SHARON: Megan and I talked about how we both discovered outdoor adventure sports through youth programs rather than from our parents. I was in girl scouts and that’s how I discovered white water rafting and caving and backpacking … all stuff that my parents were not interested in. MEGAN: I love that, that’s awesome. SHARON: In fact, my mom got roped in because we had a co-ed venture scout troop at one point. SHARON: They had to have a female chaperone and a male chaperone for every trip and we just could not find a female chaperone and I really wanted to go on this trip. It involved staying in a cabin, so it wasn’t tent camping at least, but it was a cabin in the middle of winter in Pennsylvania. MEGAN: [laughing] I bet your mom was so excited. SHARON: there was like two feet of snow on the ground. [laughing] Cause we were going on a snow shoe trip. SHARON: YEA. So my mom, she went. I gotta give her credit now because this was so far outside her comfort zone. But my mom, she brought her full length fur. MEGAN: Yes, yes, that’s what you need [laughter]. SHARON: That she would normally wear to the opera and she brought that on our snowshoe trip. MEGAN: She was the most fashionable one out there. Yea. SHARON: … little smokies. It was mostly a boy scout trip. MEGAN: That’s all you need. Just sustain yourself into the night. SHARON: Yea. Yea. I am sure she packed some Frappuccinos and just stayed inside in the cabin with the wood stove and the fur coat, reading her novels. MEGAN: There is something so cool about what GCY provided in terms of that like independent adventuring. Where like we were there as a little river family, but there were also those moments where the guides didn’t have anything planned and they were like, “well, whatever you guys want to do” and that was super fun. MEGAN: Yea, yea, and that’s another big part is, of course the community service didn’t stop. Yea, it was a fun way to learn, kind of just like, “Oh, I wonder what this plant is?” and the next thing you know you are looking in a plant identification book or you know looking up fish and trying to sane backwaters all that kind of fun stuff. It opened my eyes to the ways in which all of those things in the textbooks could be applied to the real world. SHARON: Other than now having muddy clothes to wear to school, did anything change right away after you went on that trip? MEGAN: I don’t know if right away things changed. I definitely have the personality of letting things percolate and reflect for a really long time and I think as it pertains to the impact of the river, even though I continued to go on river trips and science based trips all through high school with GCY, it wasn’t until probably my sophomore year of college that I realized that something was missing, and that was it and I needed to find a way to get it back into my life. MEGAN: It’s so true, yea. SHARON: So the seed was planted on that trip but yes, it took many years until the conditions were right for that to come back into your life. MEGAN: Absolutely. Part of the conditions being so right was that I came back; I started guiding for them, which was of course like my childhood dream, trying to fill the shoes of the awesome guide scientists educators that sparked my curiosity in the place and the activities. But then, then after a trip I went in to get my paycheck or who knows what and the Assistant Director and I were chatting and she gave me this look and was like, “What are you? What’s your plan? What are you doing?” I had just graduated college and she definitely knew that and I was like, “I don’t know. Find some winter work and then come back and guide for you guys in the summer? This is amazing.” That’s when she brought my attention to the AmeriCorps position they were trying to fill. Up until that point I had heard about AmeriCorps before but I didn’t know much about it. I think that was really the moment when the Ponderosa Pine tree really started to grow. The moment in which I realized that this could be a totally viable path. That I didn’t have to ever feel like something was missing again. It wasn’t like I was going to be developing cool programs or… I didn’t care. I wanted to know everything about the organization. I also, in like a cool book end turn of events I got to be in charge of the service clubs that were still happening. Weirdly I went back to my high school and started talking to kids like the people used to for me. SHARON: Yea, what did that feel like? MEGAN: Oh, bizarre. You know, kind of imposter syndromey… I don’t know if I am qualified to do this. SHARON: I asked Megan how she got over that feeling of imposter syndrome. MEGAN: I realized I am not here to teach these kids anything; we are all just learning together. Learning still what our community needs, a place I had been in and out of for four years during college and definitely huge changes and I couldn’t assume it still needed the same things as when I was a youth. In those ways it was fun to grow alongside them again … and again and still. And Emma, the Executive Director, I feel like is my personal guru on service learning. But yea, it’s like filling that gap of not just assuming what the community needs, but also not even assuming what you have to offer. As soon as you give your entire heart to a service project, who knows what is going to come of it? It’s fun too to do the reflective side of it with the students. Oftentimes I see myself getting stuck in the checklists. I am like ok, we gotta get this done, because it needs to happen, but forgetting to reflect on, “well, do we think we met our goal? What else is needed here? And if it’s not us, then what does that look like? How is this project sustainable without us?” if that’s what is needed. Yea, it’s all these good questions, often not with a great answer. SHARON: There’s this implied piece of this I think. In my mind it’s coming to me as all these thoughts around moving from doing to being. SHARON: Especially how much people who want to help focus on the doing and we are always like… Yea, we’ve got our checklists and if we could just do these ten things for these people on this project than we would have made an impact. Sometimes the harder thing and the more impactful thing is just being. MEGAN: Yea, it’s so true. Sometimes it is like you are saying, just backing up and living in that space of just gathering knowledge and research. We did this project with NPA students, it was all about homelessness. They were really excited about this idea of putting themselves in someone else’s shoes, in this case someone experiencing homelessness. And kind of doing this event, which they were calling Box City. The idea was to spend a night out on school grounds with cardboard boxes and minimal blankets, whatever it may be. The first hurdle there was, it was too cold. We legally could not sleep outside on school grounds with these students. So we had a really good conversation about that. Wow, ok we got to shift this whole thing up, we will sleep inside the school now, but we have to acknowledge that it is REALLY cold outside and some people don’t have that option. And then we had some speakers come in. It really turned more into breaking down the assumptions and the barriers there. It was super impactful for all those students, and for me. The information still definitely sticks with me. But I think that’s a good example of, well, sometimes we just have to sit in the problem and be the best participants we can be with it, but know that our one action is maybe not the altruistic like, “I am going to come in and solve this for you”. 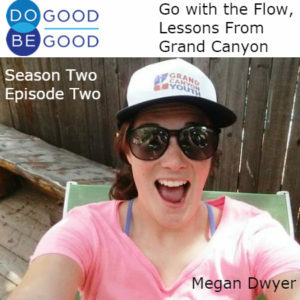 Season Two of Do Good, Be Good is sponsored by my AmeriCorps Webinar Series. I offer live webinars for AmeriCorps supervisors and AmeriCorps members on topics such as member recruitment and retention, and Life After AmeriCorps. Contact me at connect@sharonspeaks.com for more information. That’s connect@sharonspeaks.com. Mention this podcast for a twenty percent discount. Now back to our show. MEGAN: Go with the flow is such a huge life mantra that is forgotten, remembered, that I drive to drill into my brain in difficult moments; and that like blind sides me. It is such as good grounding force in everything we do, whether it is a river trip or a service project and it’s interesting how I see it affect a lot of the youth that I am working with now. And I definitely see that reflected in myself sometimes, “Yea, I know I need to go with the flow, but I can control this part of it”. I am sitting at a scout and I am thinking, “Why are we scouting this rapid? It’s going to do what it is going to do at a certain point. I can yarn on my oars all I want but my boat might do what it’s supposed to or it might not. It might just not be my day.” I think the other piece of that is that at no point have you stopped in your path on the journey and that’s what I think helps me to keep going. So even if Go with the flow equals huge challenge and hurdles and things not going your way, maybe that’s not what’s needed right now. You are still on this journey and you are still searching for information or in the place, present, like you said. Sometimes that is all we need as a society, is just to be present. SHARON: Megan shares a story from a trip that she took in which all of the youth shared the experience of having a parent who had died in the military. MEGAN: This one kid was like the clown of the trip. Everyone loved him, he had the greatest personality, so charismatic; I loved everything he had to say, so kind, always helping people. For these trips, the students will sometimes write up bios about kind of what happened to them. That way, it kind of brings us all on that equalizing page. We don’t have to sit down that first night and say, “oh gosh, what happened to all of you guys”. No, we are all just humans here. Stuff has happened to all of us and here we are. Myself and the guides found out that this individual had witnessed his own father’s death on a military base in just like a freak accident when he was like super young. I just remember that that night we did a sunset hike up over where we could see all of Monument Valley, just a beautiful vista. I just remember losing it because this kid, man, not even close to something like that happens to all of us, but particularly for myself, I am thinking … and I just lost it. I just can’t handle the situation, exaggerate everything that is going on, like this is the worst, the world is ending… here’s this kid who my story couldn’t even get close and you would have never known. He took it in stride, he went with the flow and had totally chosen the path of being present and without even knowing it he so well embodied what I hope all kids get out of our trips and I think that self-capableness that I got out, yea, he’ll just always stick with me. Another partnership program that we run with, an organization called Daring Adventures down in Phoenix, they do a bunch of cool outdoor adventures with different abilities youth. Yea, you are just surrounded by a bunch of participants who have been told their entire lives that they couldn’t do a bunch of things because of their different abilities. Then we are out here on our boats and rigging up wheelchairs and crutches and all of this great stuff, going on the same hikes we would go on with anybody else. There is a sense of “yeah, we all can do this” on those trips, you know? This particular kid was in a wheelchair, I always forget the particulars but I think it was some kind of muscular skeletal thing … by far out past his life expectation that doctors had given him. Honestly, probably just by the sheer will of wanting to say that he could do all this stuff. So we took him on the San Juan trip. He just had this charismatic… nothing was going to get this guy down. One night we pulled out the costumes and he dressed up as a girl and then was talking to us and was like, “I think I am going to sneak over to the girls camp tonight and see if I can pass as a lady” and man if we didn’t just continue to laugh with him and joke with him about all the things he wanted to do. I think for me it was kind of shocking because As I said, I percolate on things for so long… but the next year I was talking to one of the guides who was on that trip and then the people down at Daring Adventures and dangit if this kid didn’t have plans for the next year to hike down to the bottom of Grand Canyon and see the Colorado River. That was it, so he has seen the San Juan, he wants to see the BIG river, you know? And he did it! They got this whole group of people together and they hiked him all the way down. He got to put his whole body in the frigid water. I think for me it is just another great example of just doing, not being afraid of the barriers or the hurdles or even the unknown of what could happen if I tried this. I am sure, I am sure he has had some moments of questioning if he could, but that kid never gave you the sense that he was ever going to be stopped by that. That is so powerful to see in kids too. And again like that humbling, wow, I am definitely learning more from you guys than I feel like I am giving to you. Just that equalizing power of the river as well, no matter who you are with. Even if you stack a trip with all of your friends and go out for four days you come to this understanding within self that we are all struggling, we all need help at certain times. We also all got this at certain times and don’t need help. We need each other and we need to be not with others. And all of that is ok.
SHARON: Before Megan left I asked her what she felt it meant to be good. MEGAN: I think just being honest with yourself and also with that, knowing that your best one day might twenty percent, heck it might even be five percent, but that was your best. Being good doesn’t always have to look like 100% to everything all the time. If you have the right intention, and you are okay with going with the flow, then you are good. SHARON: Thank you for listening to Do Good, Be Good. For show notes on all of the episodes, visit dogoodbegoodshow.com. If you want more behind the scenes stories and insights, check out the show page on Facebook at facebook.com/dogoodbegoodshow. Thank you to Megan Dwyer for coming into the studio and sharing her story. I was thinking of your dad when he drove me back to your car, how he was wanting you to pursue a job that would make a lot of money basically [laughter] and that he didn’t understand how people would do something like AmeriCorps where they would chose to give up a good income to serve their community and then there came the awkward moment when he asked, “Well, what do you do?” and at the time I was the AmeriCorps program director who had hired you to do AmeriCorps and I had to turn to him and say, “Well actually, I convince other people to give up a particularly good income to serve their community” and I love that he did not miss a beat and he just looked at me and went, “But you make good money don’t you?” and I had to admit to him that yea, I was fine, at least I had good benefits. To subscribe to the podcast so that you get that episode as soon as it is released, search for Do Good Be Good in Apple Podcasts, Stitcher, Google Music, or your podcast app of choice. This podcast was produced with help from Sun Sounds of Arizona. Music in this episode is Bathed in Fine Dust by Andy G. Cohen, Released under a Creative Commons Attribution International License and discovered in the Free Music Archive. Until next week, this is Sharon Tewksbury-Bloom signing off.